Microsoft recently announced the latest addition to their lineup of computer hardware: The Sculpt Comfort Keyboard. Thanks to the efficiency of Redmond’s PR team, I had a sample in hand within a few days of requesting it. The Sculpt isn’t exactly a one-keyboard revolution in typing, but it incorporates some solid features into a comfortable package. The new Microsoft Sculpt Comfort keyboard is based on the popular Comfort Curve design, but incorporates several new features. When I first heard of the Sculpt, I hoped that it might be a successor to the Natural 4000 – preferably one that wouldn’t require a sledgehammer on the spacebar. While the Sculpt’s spacebar is fine, one look shows it is not meant to replace Microsoft’s current split model. Instead, the Sculpt is a new riff on the Comfort Curve – a lastingly popular compromise between ordinary keyboards and ergonomics. The obvious frontal curve of the Sculpt offers more than just aesthetic appeal. 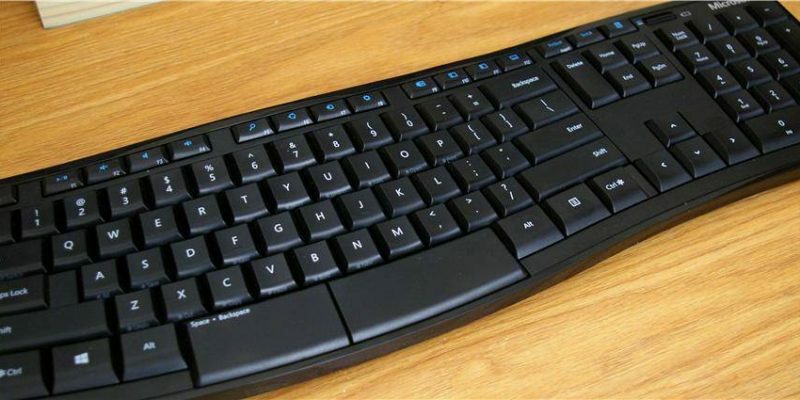 It also encourages your wrists to stay straight while typing, instead of bending to line up with the key rows. This lateral bending – called ulnar deviation by orthopedic wisemen – is a leading cause of RSI. Look carefully and you’ll see that there’s another curve as well, this one in the vertical dimension. The center of the keyboard is slightly elevated to help ward off pronation – the palm-down position induced by flat keyboards. By pulling up the thumbs just a bit, this tent shape helps the wrist stay in a more neutral posture. The Sculpt design doesn’t do nearly enough to please most ergonomists, but it does represent an improvement for users who would never touch a more extreme ergonomic keyboard. If there’s one thing Microsoft’s hardware division knows how to get right, it’s palm rests. Theirs are never hard, scratchy, or too thick, but always smooth and just cushy enough to suit. The Sculpt is no exception, and its palm rest is also removable (though taking it off will do you out of another nice feature, which we’ll get to next). “Negative tilt” is good for more than just political ads. Since many desks are now built with lowered work surfaces, it’s often a good idea to elevate the front of the keyboard so that your wrists don’t bend back. The Sculpt accomplishes this with two small fold-out feet – on the front where they belong, rather than on the back where many manufacturers still persist in putting them. These feet are built into the palm rest, so you’ll need that accessory to use this feature. The Sculpt with the tilt feet engaged. Probably the biggest story about the Sculpt is its spacebar. Or should I say spacebars? The thing is split like the 112th Congress, with a little more than half going to the right, and the rest veering off to the left. 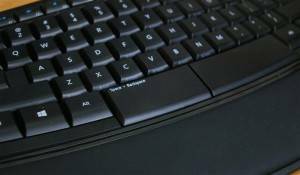 In a move that’s bold if not exactly new (Kinesis contoured keyboards have been doing it for years) the Redmond engineers decided to replace half the spacebar with the third-most-used key of all. Care to guess? Yup – Backspace. Which I just used typing that. And that. 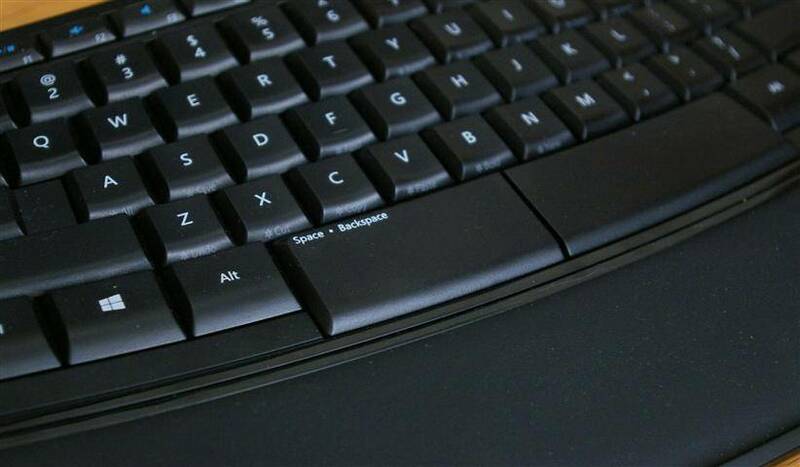 The spacebar has split in two, with the left section doubling as Backspace if desired. Having Backspace under your left thumb can be convenient, but there are a couple of potential drawbacks. First, your right thumb might get stressed from having to do all the spacebar work alone – seriously, I have thumb trouble and mine was definitely not happy with the missing alternate. Second, you can count on an adjustment period saturated with industrial-grade frustration. It takes time – and plenty of accidental backspaces – for your brain’s motor section to learn that depressing the left thumb no longer produces the same effect as before. This feature is really something you have to try for yourself. My brother, for example, loves it. I, for example, don’t. Fortunately, the function is both optional and off by default, activated only when you hold down both sides of the spacebar for several seconds. So if you don’t like it, you’ll never even have to know it’s there. I’m not among those waiting eagerly for Windows 8. I love Windows 7, and haven’t heard anything that makes 8 sound like much of an improvement for my purposes. If you feel differently – or couldn’t find a 7 model when you bought a new computer – you might be interested in the Sculpt’s special Windows 8 function keys, which double for the F1-F12 row along the top. Functions covered are Search, Share, Device, Settings, Flip, Switch, Snap, and App Bar. Nothing drastically exciting here – but then, you could probably say the same of Windows 8 itself…. Keyboards which do not include extra buttons for special things like play, pause and calculator – in other words, most ergonomic keyboards – generally assign those extra functions to the F1-F12 row along the top. Since programmers would riot if these F-keys were done away entirely, this requires the use of a special key to toggle the function set. Or, in the case of the Microsoft Sculpt, a special switch. Using a slider switch to toggle the Function row really is a new idea as far as I am aware, and I found it quite interesting at first glance. After trying it for awhile, I think it’s great – provided you’re either a Function-key-hitting programmer or a music lover with a need for media keys. If you’re unfortunate enough to be both, having to flip a hardware switch in order to rename a file or mute your music is seriously un-fun. What is wrong with this battery case? One of my first hasty notes on the Sculpt read, “I can’t believe they shipped this thing with DEAD BATTERIES!” As you might deduce, I was having trouble getting it to come on – until I tried some quasi-new batteries from a flashlight. It turns out that I was apparently wrong about the original batteries themselves, but the difficulty I encountered may indicate a deeper problem. Even smoking-fresh batteries didn’t seem to work right away, but required some jiggling before the lights would come on. Thankfully, the keyboard has been working consistently since being thus jiggled. Keep in mind that this is all totally anecdotal and may not indicate anything significant about the construction of the Microsoft Sculpt. With the palm rest removed the keyboard is more compact, but you won’t be able to use the front tilt feet. If you’re ready to go bold with ergonomics, get a real ergonomic keyboard. The Kinesis Freestyle, Keyovation Goldtouch, or even the Microsoft Natural 4000 will answer this description. The 4000 is actually less expensive than the Sculpt – which brings us to the biggest drawback of the new Redmond offering: It costs about $60. While that’s not outrageous for a good wireless multimedia keyboard, sixty bucks is over halfway to a Freestyle or a Goldtouch. I personally would think twice before spending it on Windows 8 function keys and crowd-pleasing curves. Still, the Microsoft Sculpt Comfort Keyboard is comfortable enough to use, and a fine option for those who shy away from more radical designs. Disclosure: This review was made with a complimentary sample from Microsoft.